Prior to World War II, Muroc was the dry lake bed of the early hot rodders. After the war, the action moved to El Mirage but in 1996 the racers returned to Muroc for the first time since it was shut down for the war. According Leslie Long in the 1999 Muroc IV Southern California Timing Association Program (found in the trash), Zeppo Marx and Phil Berg (agent for Clark Gable) have a dinner party argument over who's car is faster. They place a $10,000 bet that Zeppo's Mercedes (perhaps a 1931 supercharged SSK, if you are to believe scant German internet references) is faster than Phil's Duesenberg. Gilmore backs the race, AAA establishes a track and rules, Mercedes sends a driver for Zeppo's car and Phil engages Eddie Miller at the Indianapolis Speedway's suggestion. The story becomes a little murky at this point. Eddie Miller tunes up and strips down a 12 cylinder Auburn and tests both the Auburn and Gary Cooper's heavier Duesenberg at Muroc. Now, the original bet was 'my car faster than your car' and there is no mention of Phil's original Duesenberg so it seems Zeppo would be off the hook for the $10,000. On race day, the Berg's, the Marx brothers, Carol Lombard, Al Jolsen, Mae West, Clark Gable, etc. took four buses to the 6:30 AM race. Now, Muroc is better than 100 miles from LA and I can't imagine a busload of Mae West's and Clark Gable's on a bus at that hour. We are trying to contact Leslie Long to get more details. The Mercedes was faster as it crossed the line after the pace lap, but the Duesenberg caught the Mercedes at about the halfway point. According to Eddie Miller, '... at about the 3 mile point I pulled along side him, looked down on his little car and could hear the blower engaged so I just drifted out a bit and eased off to stay abreast. I wanted to make a nice close finish to the first lap so I began pouring on the coal pretty hard but didn't quite make it; I was about a car length behind him when he passed the pole the first time. But about 1/2 mile after that I just walked on past him. He wasn't running so well. I was doing 108-109 holding about 1 mph in reserve in case he should get that thing working again. As I came by the pole where the people were waving and cheering I looked back but could not see any sign of the competition. I backed off a bit, completed the final lap and took another just in case." Eddie went on to set a 500-mile record of 113.57 mph without a stop and kept going until a punctured tire stopped him in the 610th mile. 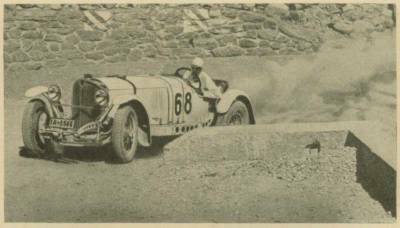 The photo above is clearly not from Muroc, but is a racing Mercedes SSK. Note the drilled frame for weight reduction, but still full fendered and headlighted.